368 pages | 112 B/W Illus. Whether it's because of a lack of understanding, poor planning, or a myriad of other things, 50 to 60 percent of the IT effort in most companies can be considered waste. Explaining how to introduce Lean principles to your IT functions to reduce and even eliminate this waste, Lean Management Principles for Information Technology provides the tools and understanding to make better decisions, increase efficiencies, and make IT a major force in delivering sustainable improvements to your supply chain. The text reviews the major management challenges facing IT and illustrates solutions with stories, examples, and case studies of how Lean IT has led to unprecedented improvements in the private and government sectors. Demonstrating how to structure the components of your IT system in accordance with Lean, the book details the measures required to achieve and sustain a world-class Lean IT supply chain management system. 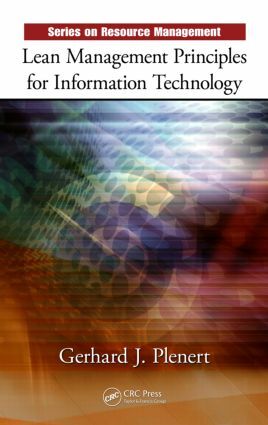 WHY A BOOK ON LEAN INFORMATION TECHNOLOGY? Why Look at IT? What Is the Problem? So What Does Lean Bring to the Table? What Does an IT System Look Like? Are We "Doing the Right Things?" What Loop Am I In? BRINGING LEAN INTO INFORMATION TECHNOLOGY? How Can Lean Help IT? Are We Working on the Correct Problem? Or Are We Creating More Problems? What is the Best Measure for your Organization? Dr. Plenert’s ideas and publications have been endorsed by people like Steven Covey and companies like Motorola, AT&T, Black & Decker, and FedEx.